It was a sad, sad day when I realised unicorns didn’t exist and that I would be riding a bike instead of a magical beast to school each day. Cyclops on the other hand – wasn’t phased. I was quite happy with those one-eyed monsters just being myths AND YET; it has been recently brought to my attention that they’re not so mythical after all. 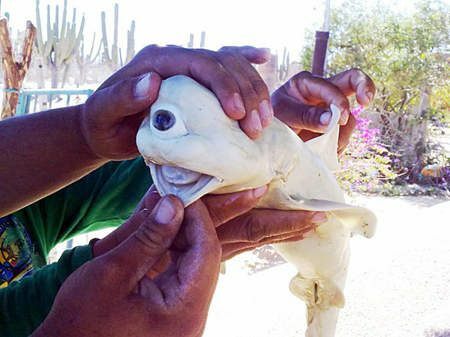 Cyclops live amongst us, and in this post eye’ll spy with my little eye… a single eye, on a shark, kitten and goat. They’re all suffering from cyclopia, an extremely rare mutation that leads to drastic change in facial features including, most noticeably, just one huge eye in the centre of their face. In 2011 a fisherman caught a pregnant female Dusky Shark off the Gulf of California, only to find an unusual looking embryo inside. The pup inside was suffering not only from cyclopia but had perfect albinism as well, a complete lack of pigmentation. In addition to the gaping eye, animals with cyclopia have a range of other features. As you can see on the shark there’s also a lack of nostrils, a bump on the head and a flat snout. And while the head is so abnormal it looks cartoon, the rest of the body was completely normal in structure and function. Back further to 2006 and meet Cy, a kitten born with cyclopia. Despite the owners best efforts, sadly he died from the mutation not long after. Perhaps you’re wondering why? Sure the vision is poorer but you can still see with one eye. And having no nose makes you look a little Vodemort-y but you could still breathe through your mouth? The problem is that cyclopia is also always associated with alobar holoprosencephaly a word which has probably made you immediately want to stop reading BUT simply describes the brain not completely separating into its two hemispheres. This not only causes the facial abnormalities but also leads to problems with brain function too, which is why most cyclopic animals die not long after birth. 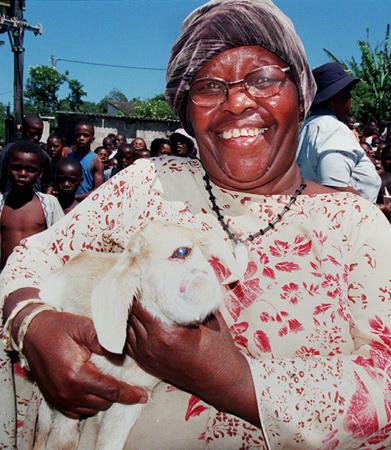 Lastly in 2004, a village in Folweni, South Africa were amazed to find a goat born with a single eye. They called him Umlingo, meaning miracle – but what actually causes this rare mutation? There’s a plant, Veratrum californicum a.k.a Western False Hellebore, which if eaten early in the female’s pregnancy can cause this deformity. Otherwise it can happen spontaneously as well and this is even rarer. Scientists found just one case of the mutation in 22, 000 mice, one case in 25, 000 rats and eight cases in 10, 000 rabbits. So now you know. A rare mutation is bringing cyclops out of mythology and into the real world. 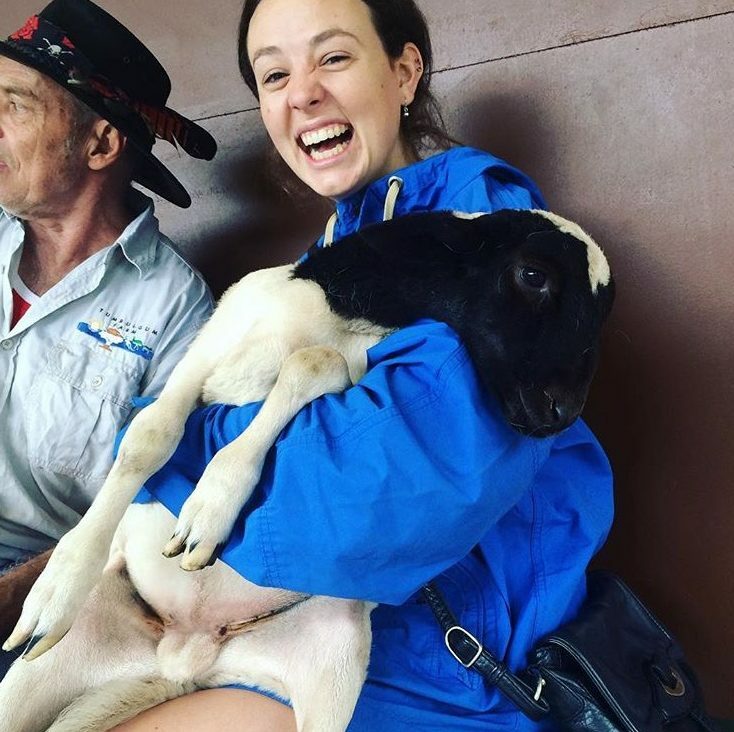 Their fascinating faces show us just how great the repercussions can be from a tiny tweak in an animal’s development and also reminds us just how well the two eye thing works. Bejarano-Álvarez, O. M., & Galván-Magaña, F. (2013). First report of an embryonic dusky shark (Carcharhinus obscurus) with cyclopia and other abnormalities. Marine Biodiversity Records, 6, e11. Pourlis, A. F., Ioannou, A., & Magras, I. N. (2003). 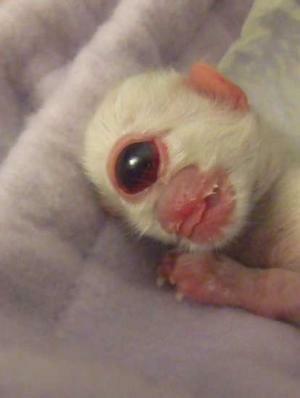 SPONTANEOUS KITTEN’S CYCLOPIA. CHAVKOVÁ, Z., GUZY, J., MAREKOVÁ, M., CHOVANOVÁ, Z., TOMEČKOVÁ, V., 47(1), 48-51. Haha! I am glad, will look forward to more interesting stuff!